The next challenge...the design. Ah, the design. My process for designing quilts is kind of weird sometimes. I rarely just sit down and design a quilt. It usually takes weeks (sometimes months) for my ideas to evolve into a final design. This quilt, for example, started with me deciding that an Aztec style quilt was an acceptable use of the color Marsala. (Seen any authentic Aztec rugs lately? Quite a few of them use this color!) So I perused the internet- screen shotting pictures of Aztec bedding, shower curtains and rugs. 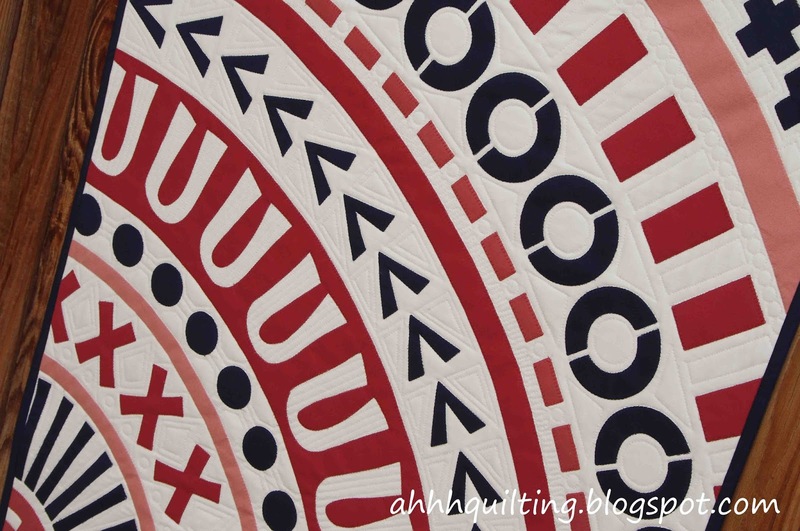 I mocked up several strip type quilts in this style, but there was one small problem...I am not particularly drawn to the angularity of Aztec motifs, so I never came up with anything that thrilled me. But I kept hanging on to the idea because I had nothing else. 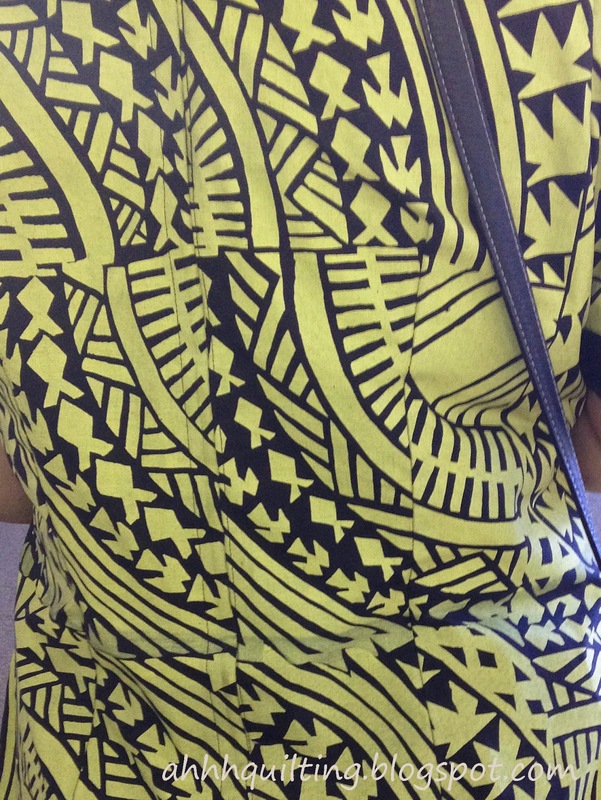 Then, I saw a woman in church wearing what I found out was a Polynesian Tapa print (yes, I chased her down after the meeting and asked her if I could take a picture of her dress-and yes, I know I'm kooky). Here's the dress...I liked the curves and repeating shapes in this design- so I looked at a bunch more Tapa prints online and tried to come up with something good. But it just wasn't working for me. So I thought about it more and finally decided to try making an Aztec style quilt with the shapes in a radiating circular layout, rather than straight strips. The idea just wasn't coming together because I was still trying to use a lot of triangles and other Aztec-y shapes. Finally, I got smart and just made the design using letters and symbols from different fonts, which I put on circular paths. One thing led to another, and I ended up with the final design. We can all thank Inkscape for this, of course. Oh, the fun there is to be had with Inkscape!! Have I mentioned that it is FREE? Of course this little gem is completely appliqued using fusible web. I cut most of the shapes out using a Silhouette Cameo (I'm in love with that machine)! I cut this whole quilt out in a little over an hour -this is awesome because there are like 100 little pieces. Oh, and did I mention that this quilt is 30 x 39"? Yeah. So in order to place these shapes perfectly, I printed the quilt out in its actual size (it took 16 pages) and taped it all together. I laid the background fabric over the printed quilt so I had a guide for where to put the shapes. Then I ironed them on. Worked like a charm! Anyway, I finished with my usual method - blanket stitch around the shapes in matching thread. I quilted stitch in the ditch around all the shapes and filled in the white space with different designs. When I was done I showed it to my husband and he said he thought it needed more cowbell...er...quilting. (SNL fans? Anyone?) :) So I threw it back on the frame and added a bit more. No picture, but I backed it in all the leftover reddish-brownish fabrics pieced together (because seriously, I will never use them for anything else) and bound it in the matching navy. Its beautiful! I can just imagine it hanging on a wall! Perhaps one of your friends will feel the same! Good luck in the challenge- it will be getting my vote! LOL more cowbell. Love it. 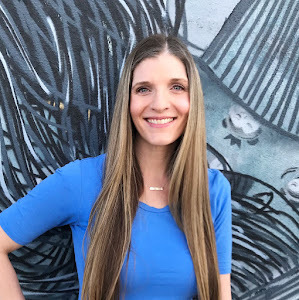 I think your design is brilliant, and I really appreciate you sharing its evolution including a photo of the inspiration! I really like it. The design is fantastic and the colors work together well. Nicely done. I agree that Marsala is a goofy color, I looked at it and decided I didn't want to work with it. But your quilt is of course gorgeous!! Honestly, I don't think I've ever seen anything like that! 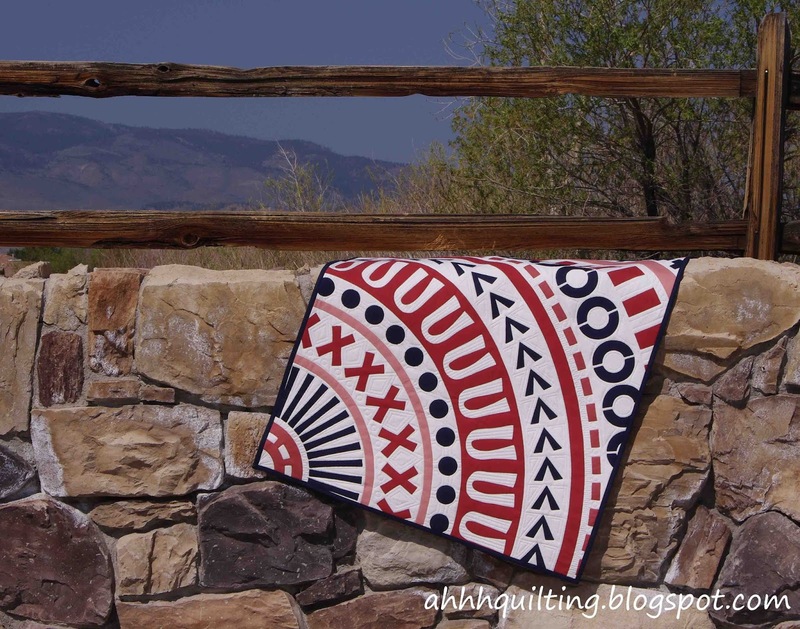 You are one of the most creative quilters I've ever seen - so glad I found your blog online. Keep these fantastic ideas coming! I'm speechless - it's beautiful. I think you nailed it! With such a hard colour to work with, THIS makes it beautiful. Wow. This is absolutely beautiful. I love your subtle Red/White/Blue color combo too. It's beautiful! The colours, design, quilting, everything! Very nice work! 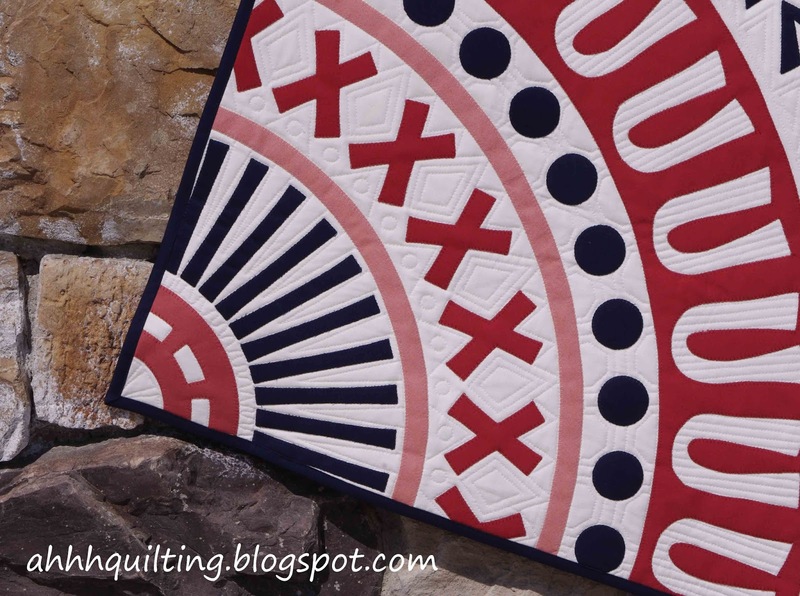 The shapes you created with the fabric and the quilting are just wonderful. The sharp edges are so crisp and bold and you really nailed mimicking the Polynesian Tapa print. Oh and I didn't even mention the asymmetry, I guess I could go on and on about the elements of design you used to create this beauty but it is just wonderful. It looks stunning - excellent! 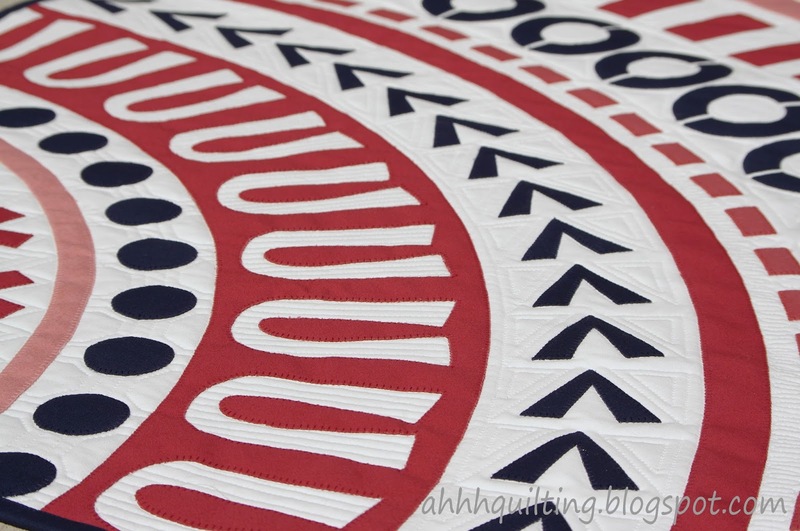 Your description of the pattern and process makes the quilt even more magical! I LOVE it. You did a wonderful job. Thank you so much for the details on how you came up with that design; I'll be stealing some ideas. And I might just have to try out Inkscape. This is gorgeous! It reminded me of looking up at a hot air ballon because of the 'spokes' in the corner. Very nice! This is a totally stunning quilt, Cynthia. I was blown away by it when I first saw it. Thanks for telling us the story of its development. I have to say that I think you disliked the color more than me. I couldn't even give the paint chips away to fellow quilters. No one would take them. Mine came out better than I thought it would also and I mailed it to a nephew this afternoon. I love your choice of navy and the design is so tidy and clean (I think you did one with circles last year that I loved). Great job. WOWSERS girl! 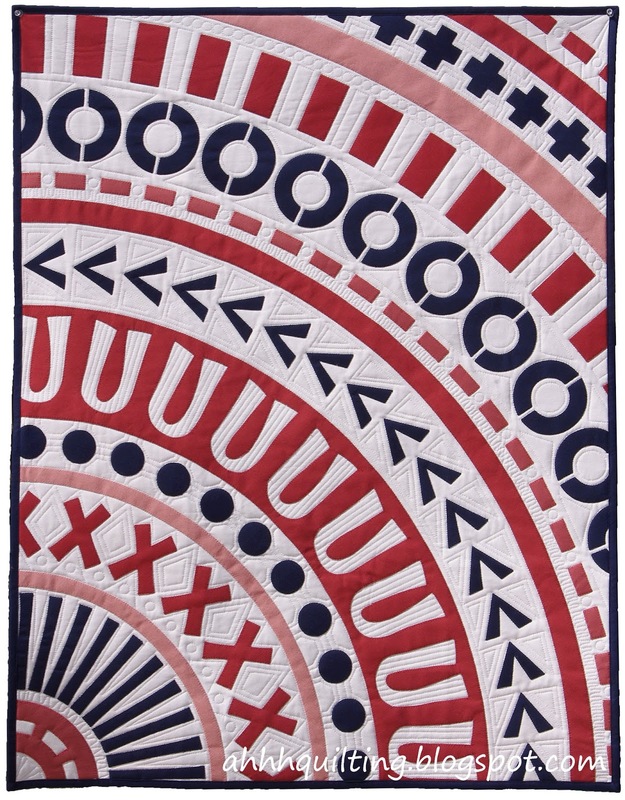 This quilt looks totally amazing. I was completely riveted to your story of its making. YOU NAILED IT WITH THE DEIGN! I am not a fan of aztec design either, so I'm impressed with your end result. I even like the colors that I'm seeing on my screen. Using font symbols is a stroke of genius! Fabulously inspiring. That's WAY cool Cynth! I didn't even notice that they were made from letters and totally had to do a double take while reading the story. When I first looked at the first picture it reminded me of a very pretty navy roulette table. It's a pretty awesome quilt! Haaa! This post is amazing. This quilt is amazing. Amazing. I think this is a wonderful quilt. I hope you come to love it and to enjoy it too. Wow! Very unique and creative, I love how you have met this challenge and enjoyed reading about your inspiration and process. Navy is a great pairing for Marsala, (whether it is brown or red!). Hahahaha well I'm glad you challenged yourself to work with the color that you so clearly disliked, and yet you still managed to come up with something striking and gorgeous. I never doubted you! I /love/ the pairing with the navy and the bold design choices you made. Stunning! Fabulous! (I just found this.) I love reading about your design process. Your creations are clever,beautiful,amazing and always so original.